Mike Pingleton and I were drifting back towards the Madre Selva field station after a leisurely morning of kayaking when my brain registered an unusual shape on top of a hunk of log suspended in some vines along the edge of the Rio Orosa. 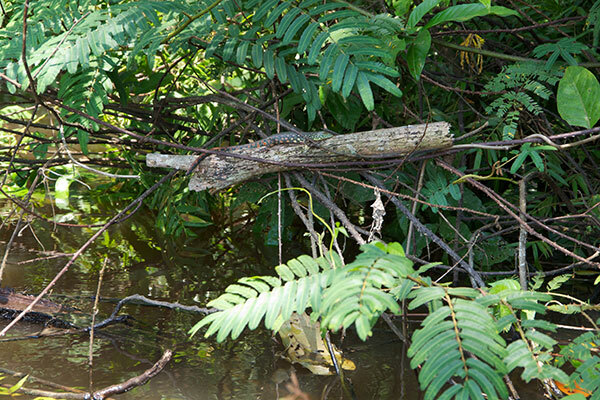 I had already kayaked at least a hundred feet past this log, but I thought I should go back and investigate. 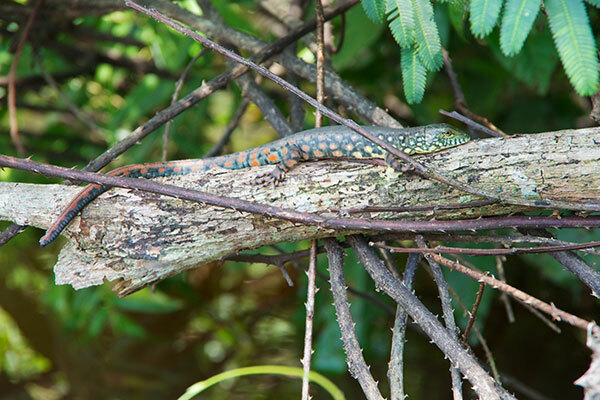 Sure enough, as I got closer, I recognized the distinctive shape of a basking lizard. 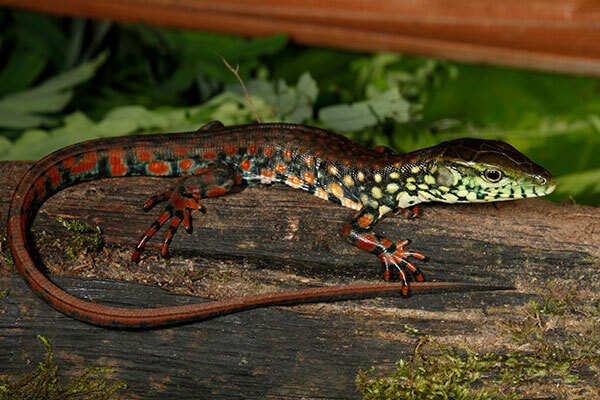 And not just any boring run-of-the-mill lizard either, but a particularly colorful one. I recognized it as a teiid, and knew that there was a large aquatic teiid in the area called the Crocodile Tegu, but this lizard wasn't all that large and I wasn't quite sure what Crocodile Tegus looked like. Mike was pretty sure it was in fact a Crocodile Tegu though, and indeed so it turned out to be. Turns out the young ones are very colorful; the big adults are much less so. The tegu cooperated for an unreasonable length of time, as Mike and I took turns nudging our kayaks into the vegetation to get ever-closer photos of the lounging lizard. When we were satisfied with the picture-taking, Mike suggested that we might be able to catch it to bring back for others to admire. 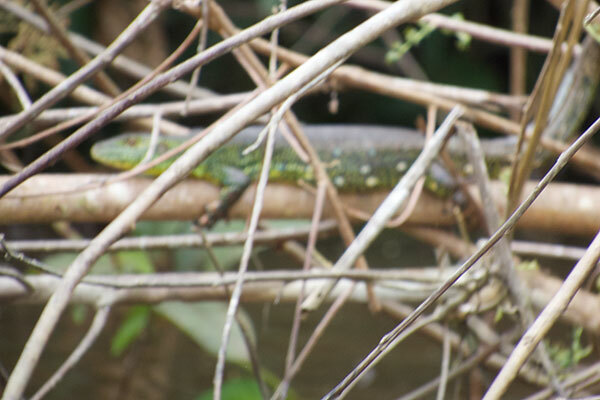 This seemed worth trying, so I nudged my kayak even a little bit closer and started leaning lizard-ward. But even this lazy lizard had limits, and that was enough to spook it into abandoning its perch and diving into the water below. So we continued our kayak journey back to the field station, one of us on each side of the river to best notice any more interesting wildlife that we might chance upon. About five minutes later, I was thinking how it was sad that I hadn't managed to catch the tegu, and how I should have waited for Mike to try to block its exit path before making my move, when my eye happened to glance down at a little floating vegetation just to the left of the kayak. And what should be sticking up from that very floating vegetation but the head of another, even smaller, Crocodile Tegu. Before my brain had fully processed what it was seeing, my left hand had snatched that little guy out of the water. I called over to Mike, laughing: "I caught a different one!" Neither of us had any sort of bag, so Mike graciously sacrificed one of his socks to hold the little tegu until we got back to the field station. I never ended up taking photos of the little guy I grabbed, but Matt Cage took some beautiful photos, and generously allowed me to use them here and anywhere else I choose. The last photo above is one of his -- thanks Matt! This year I went kayaking with Matt Cage and Lorrie Smith. 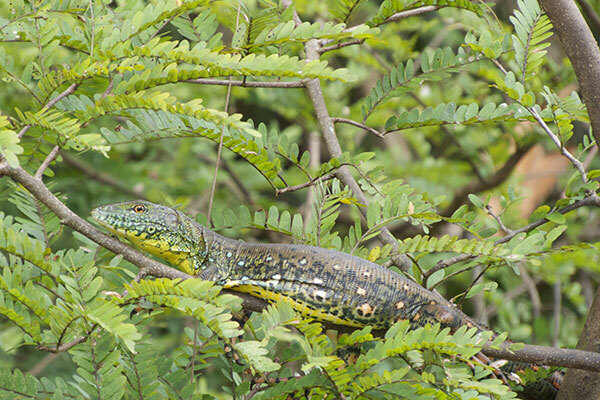 On the way out to the drop-off point, while we were still in the speedboat, a crew member and I both saw a big green lizard stretched out on a branch overhanging the river. He turned the boat back that way and I tried to focus my camera as we approached, but the camera chose to focus on the foreground branches in the one photo I managed to take before the lizard dove into the water. On the way back, I spotted another one in a similar position. This one was much more cooperative, and Matt and I both got decent photos of it from our kayaks. Both of this year's Crocodile Tegus were much larger than both of last year's.